Set in Tonkin (now northern Vietnam) at the turn of the 20th century, Flesh tells the story of a boy who witnesses the execution, by beheading, of his father, a notorious bandit, and sets out to recover his father’s head, and then find the man who betrayed his father to the authorities. On this quest, Tai’s entire world will shift. Flesh takes the reader into dark and delightful places in the human condition, places where allies are not always your friends, true love hurts, and your worst enemy may bring you the most comfort. In that emotionally harrowing world, Tai must learn to deal with new responsibilities in his life while at the same time acknowledge his bond, and his resemblance, to a man he barely knew-his father. Through this story of revenge is woven a another story, one of love, but love purchased with the blood of murders Tai commits. A coming-of-age story, but also a love story, the sensuality of the author’s writing style belies the sometimes brutal world he depicts. 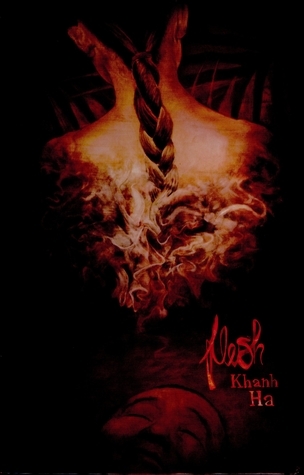 Khanh Ha was born in Hue, the former capital of Vietnam. During his teen years he began writing short stories which won him several awards in the Vietnamese adolescent magazines. He graduated from Ohio University with a bachelor’s degree in Journalism. Flesh is his first novel. He is at work on a new novel. But why is it called Flesh? I dunno, really. I guess we’d have to read it to make sense of that? 😀 I guess it’s related to the fact the world of the novel is dark, or at least that’s what I get from the blurb.